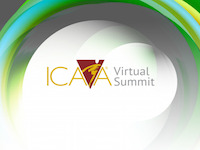 Sit back in the comfort of your office and enjoy ICAA Virtual Summits. These educational programs are delivered over the course of 4.5 to 5 hours and are specifically created for active-aging professionals - business owners, managers, suppliers, wellness and activities personnel. Attend one session or attend them all. ICAA's Virtual Summit 2018 provides vital information to help you navigate the confusing and complicated technology landscape. Four distinguished professionals with expertise in technology will present strategies on investing and selecting technology, current trends, and will present showcase stories and best practices. You will learn strategies to help you choose, implement and assess technology in ways to achieve programming and participant success. In this series of webinars, you will overview the nutritional needs of older adults, and then translate that knowledge into food choices that appeal to older adults. You'll also hear examples of how programming staff work with chefs to provide food-related programming. Even if you work in an organization where food is provided to residents or clients, you can leave with reliable information and new ideas. Wellness programs that encourage brain health are in high demand from older adults who want to be healthy and live independently-and from organizations that serve them. Professionals who develop lifestyle/wellness programs are uniquely positioned to plan solutions for people who are cognitively well today, and for those journeying through cognitive decline. Note: The Virtual Summit is focused on nonmedical approaches to promote quality of life.